SADLY THIS NEWS NOW SEEMS TO HAVE BEEN FALSE. WILL THEY EVER JOIN THE PEOPLE? 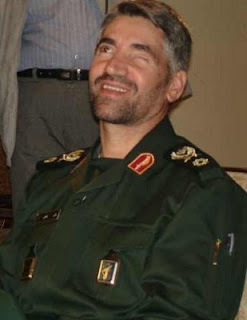 This is the picture of Ali Fazli, the Commander of the Seyyed-ol-Shohada RG units and former deputy Commander of RG Operations and a war veteran who was injured in the defence of his country against the Iraqi invasion on our country. More importantly now, a man of honour who did not betray the people of Iran and refused to obey orders to gun down his people. Commander Ali Fazli has been removed from his post, arrested and his whereabouts is unknown as a result of his decision to stand by the people against the Supreme Leader and his messianic junta. Following Commander Fazli's honourable refusal, Commander Ghassemi and 16 other heads of the RG have also reportedly held a meeting and said if they are put under pressure by the Supreme Leader to kill ordinary people, they too will refuse and resign. I hope this is just the first of many who will resign. This is good news. we need them to do more than just #refuse' and 'resign'! We need them to jointhe people against these monsters. Revolutions go forward with spurts, fits, and starts. Even if the regime survives the current uprising, their time is nevertheless numbered. But he will kill for Rasman Jani ! Could this be the beginning of the end? I hope so, at the end of the day, our army and even the Sepah are just ordinary men, most whom probably do not want to kill innocents. I hope that they can stand up to Khamenei's barbarism. The army and repub guards MUST join the people! They MUST rise up and arrest the evil mullahs and destroy those who have harmed the honourable and noble Iranian people! The window of the soul is in the eyes. Have a look at his one good eye... this is a good man. From what I have read, this split in the Revolutionary Guard is likely the beginning of the end. The regular army have also not been all that ready to fire upon their own people, and there have been splits in the ranks of the police. That leaves the Basij. BTW... if you look into the eyes of Nutjob and Khamenei, you do not see such goodness shining forth. Roger Simon actually came face to face with Nutjob and he remarked upon the evil of the man. (just like Hitler and a certain USA incumbent in the White House). Seems Ali Fazli turned out to be with the regime. It has been dismissed, there is an article on presstv.ir. He is just a thug like all the others. Sorry. I think they do not deserve any "second chance", any of them. Never believe a wolf in a sheep's skin. He will remain a wolf forever. People already killed 8 basijis.. it is horrible to say, but people like judge Mortazavi would really deserve it.